Michael McFadyen's Scuba Diving - Inscription Point to Monuments Drift On 29 April 1770, Lieutenant James Cook, RN, in HM Bark Endeavour entered Botany Bay and stepped ashore at Kurnell. Cook and his crew, including the famous scientist Sir Joseph Banks and his assistant Daniel Solander, explored the area of the bay and originally named it Stingray Harbour because of the large number of rays they caught. Cook stayed eight days and then headed north. This dive is a drift dive from Inscription Point to The Monuments. This dive can only be done on an incoming tide (it does not matter what time of the tide you do this dive or how high the tides may be). After entering the park, travel along the main park road towards Cape Solander and past the turn-offs to the visitor centre and Sutherland Point (named by Cook after one of his seamen, Forby Sutherland, who is buried nearby). About 1.5 kilometres into the park you will see a 90° parking area on your left running parallel to the roadway. There is always plenty of parking space available. In the middle of the parking area there is a stairway which leads halfway down the cliff face. This gives the alternate name to the dive site, The Steps. (Note that in more recent years - since about 1997 - some have started referring to the Inscription Point dive site as being the I refer to as The Monuments). After gearing up, take your car to the parking area near the exit point. Head back the way you came into the park and take the turn towards the visitor centre and park in one of the formal parking spots (or the less formal area at the end of the formed area) past the visitor centre. Walk back along the carpark and out onto the main road and back to the spot where you dropped off your gear. This takes only a few minutes. Walk down the steps and west along the walkway and then down to the rock platform. You will see a small bay that is the best (and really only) entry point. 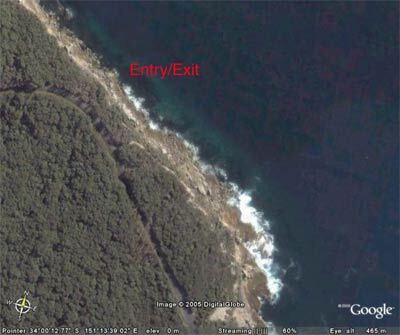 After entering the water, swim on the surface towards Bare Island for about 20 metres. Sink to the bottom and you will see that the section closest to shore is composed of large boulders that are mostly clean of growth. 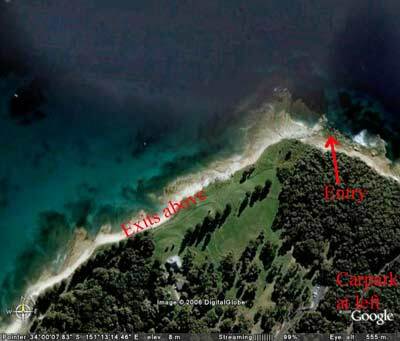 Once on the bottom, swim towards north until you reach the sandy bottom which is at a depth of about 10 metres. 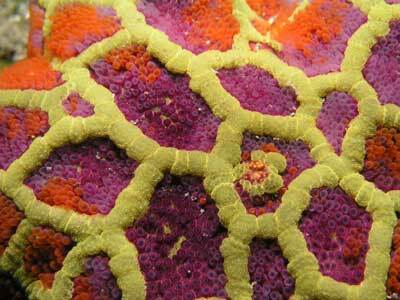 Here you will encounter a bottom littered with large boulders, mostly covered with a prolific sponge garden. Under the boulders you will find bullseyes, roughies and other fish. Follow the sand edge to the west (left) and the water gradually gets deeper to about 10 metres. At first the bottom is mostly sand with some small isolated rocks covered in kelp. There are some sea dragons in this area, as there are in all sections of this dive. After about 10 minutes you will come across a much better section. This has some reef sections and large boulders with sponges and other fixed life. This dive has some of the best sponge gardens in Sydney. However, over the period from about 1994 to 1998 a species of grass, probably from overseas and imported in bilge water in one of the giant ships that service the Port of Botany, grew over everything. Nearly every section was totally covered. Although in some spots it looked nice, in reality it totally smothered the sponges and at that time only a few remained untouched. It died off in the early 2000s but has in the mid-2000s come back a bit. 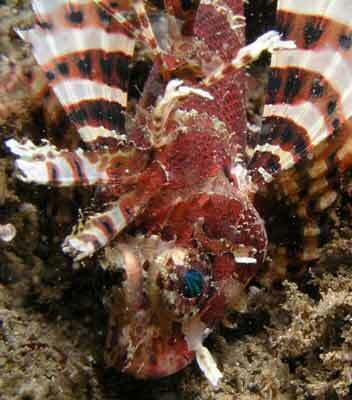 On the sand off the wall and near the boulders you should see common sea dragons. 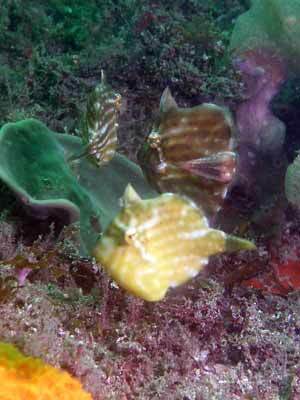 They can often be found in the small "bays" of sand on the reef edge and in between the larger boulders. 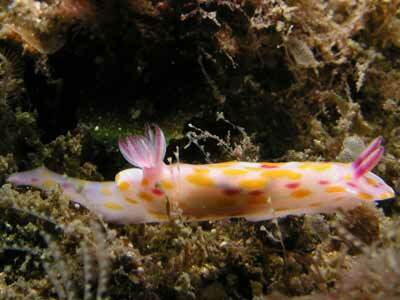 These fragile looking fish move around ever so slowly. In the late winter and early spring period look close and you might see a "pregnant" male. 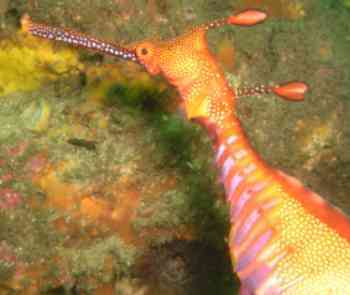 On 3 June 2006 I saw about eight sea dragons, including one small sea dragon, on this dive. On 19 October 2006 I saw nine sea dragons, of which seven were pregnant males. Jaime Sanchez Camara from Spain is carrying out a study of sea dragons at Inscription Point and The Monuments. In 2000 he tagged 90 sea dragons at this location with minute coloured tags placed under their skin and visible with a "blue light" (ultraviolet). Since then he has been coming back regularly and noting the numbers of sea dragons that he has refound. It was previously believed that that their movement was limited to about 100 metres. Until December 2004 when I took Jaime on a dive at Bare Island Isolated Reefs on the other side of Botany Bay, none of these 90 sea dragons had been seen outside the originally tagged location. However, on that dive, we found one of the tagged sea dragons, over 1.3 kilometres from Inscription Point. This is a first, showing that sea dragons may move long distances. We have seen many interesting things while diving at this site and Inscription Point. I have seen a shark (which at the time we had no idea what species it might be - I now believe it to be a very very skinny grey nurse shark) and a turtle. In June 2006 we saw a medium sized hawksbill turtle (see the photo at bottom which is a different one I saw in February 2006 at Inscription Point) just off the wall. As you travel to the west, the depth varies between 12 and 14 metres and the wall's height varies from one metre to about three metres. 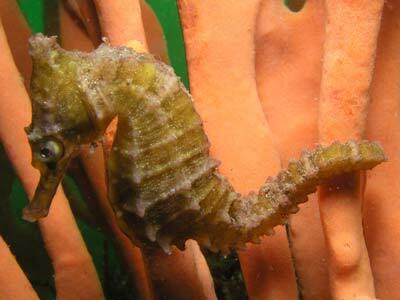 Along here in December 2007 I found a White's sea horse. After about 20 minutes the wall peters out and you will have sand on your left. Head south and after a minute or so you will encounter another wall. The depth is now 12 metres and there is an even more prominent wall. This wall is a consistent three metres high and has lots of overhangs. The depth will gradually come up to 10 metres as you follow this section of wall. Alternatively you can keep heading in a rough westerly direction for another five minutes before heading to the south-east. This will bring you into a small sand gutter that leads back to the shore. Again, another alternative is to keep heading south-westerly from this area across the sandy bottom. There is a lot of sea grass here and some interesting things can be seen, including small cuttlefish, large flathead, nudibranchs, sea hares, pipefish and more. Eventually you will pass by (probably) the channel marker and then end up on the beach to the west of Cook's water point. Visibility here is usually never great, with five to seven metres being considered especially good. You should only do this dive on an incoming tides. The drift from Inscription Point to The Monuments is a very good dive site. 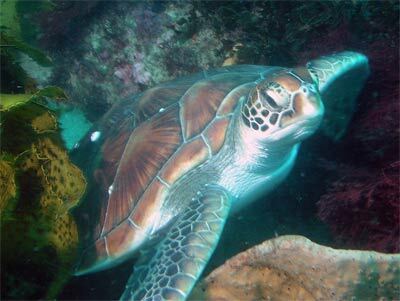 It is especially good in very strong southerly winds and seas as it is one of the few sites protected in Sydney. Even in very large southerly/south-easterly swells you can normally dive here. If the seas are from the north to east quarter and are big (over 1 to 1.5 metres) then you may have problems.